Is This The Most Elaborate Way To Hide A TV? We understand that not every decor can accommodate a big flatscreen TV mounted to the wall. But the TV Tank, which hides your flatscreen behind a giant aquarium, is like trying to conceal an Austin Mini behind a Lamborghini. It's still going to draw attention. 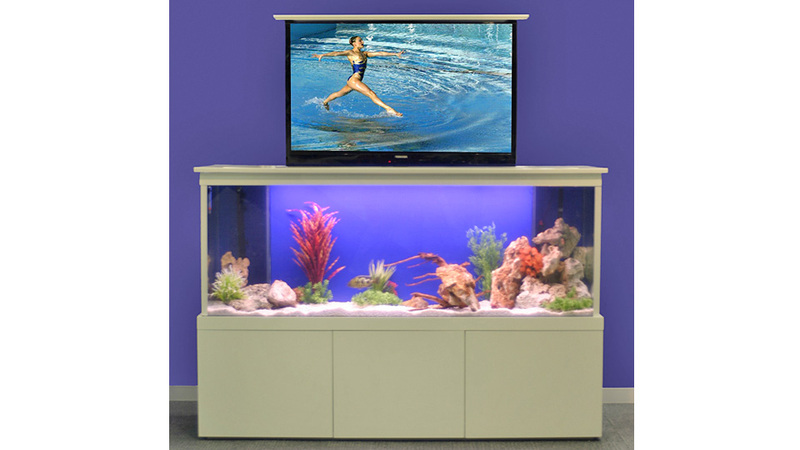 Starting at just over a mere $US11,000, the TV Tank includes everything you need to sustain a thriving school of fish and lift a TV into the air once your underwater pets get boring. It doesn't, however, include a TV; you'll need to add that — and probably the water and the fish — yourself. Also, we would have maybe even preferred the option of being able to watch TV through the fish without raising the set above the tank. There's a countless number of sitcoms that would be vastly improved with a goldfish or two added to the cast.